My affection for Ava Crowder has not been kept much of a secret in these recaps. As such, I’ve been tracking her season-long arc more closely than most. I’ve seen this coming, this moment of truth, when Ava’s soul would be at stake and the decision to willfully take Ellen May’s life would be the choice in front of her. I’m glad the show played it straight with Ava, didn’t swerve away from that choice just because we could all see it coming. There’s a degree to which the show allowed itself to have its cake and eat it too, with Ava making the decision to spare Ellen May (or herself, more accurately), only to have first Colt and then Tim step in to take over the gunplay. But Ava made her choice clearly, and even moved to stop Colt from making that choice for her — though just to what lengths she’d have gone to stop Colt is the kind of unknowable question that keeps Ava a bit murky, and she and the show are better for it. It’s a fine centerpiece scene for a fine episode of television. So how’d we get to it? 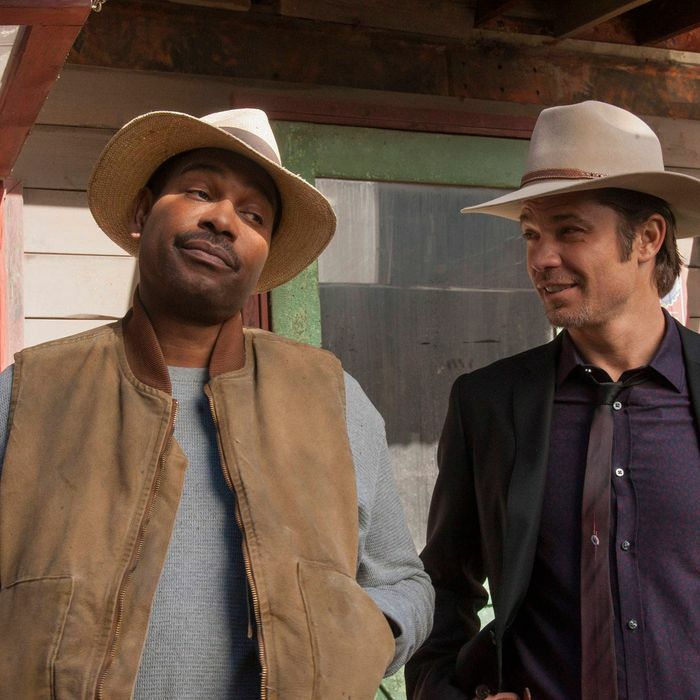 After Raylan gets his round of applause at work (which he brushes off because he’s on the phone with Winona, who quits nagging him long enough to announce they’re having a baby girl), he is promptly suspended for all the breaking of rules he generally breaks in the course of a season. But the job isn’t quite done. Shelby is refusing to testify against the Tonins unless the Feds get Ellen May out of Noble’s Holler and into protective custody. It’s enough to make you want to give Shelby a big old hug, just not if you’re Raylan or Art. They toy with the idea of letting Shelby rot in prison until he changes his mind (or the Tonins kill him), before thinking better of it. And so Raylan convinces Art to let him have Tim and Rachel for One Last Mission. Before he’s hopefully suspended one day before Winona has the baby. With Raylan going after Ellen May, obviously Boyd Crowder couldn’t be far behind. After Johnny completes the spectacular fumbling of his would-be power play by failing to get Limehouse to agree to take $300,000 of Tonin money in exchange for Ellen May, he’s useless to Detroit, so they call up Boyd and offer him Johnny in exchange for obtaining Ellen May for them. This dovetails nicely with Boyd’s agenda, since he and Ava just decided to make tying up Ellen May’s loose end a priority. Boyd’s willing to crash Noble’s Holler with guns blazing, but now that they have Tonin money to play with, Ava offers to make the deal herself, alone. Limehouse has been in an interesting position. All he wants is to shore up the finances that were taken from him in last season’s finale. But his position this season has been to dangle various MacGuffins just out of reach of the major players, be it Shelby or Ellen May. Here, he straight-up refuses to allow Ava to ruin herself by taking Ellen May’s life. It’s a wonderful scene, leading up to a wonderful line, when he flat-out tells her, “I can’t do this. And you shouldn’t either.” I didn’t think Ellstin Limehouse and I had a whole lot in common, but neither one of us wants to see Ava lose her soul. So we get that climax, with Ava finding Ellen May at Cassie’s tent, having just unburdened herself. Ava’s decision is an active one, choosing to take her chances knowing Ellen May, and now Cassie, have one hell of a chokehold on her. But she can’t do it. Colt sure can, but Tim has something of a sixth sense about old Colton Rhodes, and after a standoff and some talk about post-traumatic soldier stuff (wherein Colt admits to killing Mark), Colt draws on Tim, classic suicide by cop. Tim’s soul is intact — he was justified and all — but nevertheless he and Cassie get to have a good talk about innocence and guilt and moral shortcomings. As foreplay goes, it could use some work. Finally, we set the table for next week’s season finale. Boyd and Ava come to terms with her choice, Colt’s death, and their future. Ava is suddenly a believer in fate, and after what happened in Cassie’s tent, it’s hard to blame her, but Boyd is resolute that he makes his own fate. One thing is certain: They’re going to have to get rid of Delroy’s body if they’re going to keep Ava safe from prosecution. And finally … Winona. Whom I love, even if she’s constantly written as a perpetual nag-monster. Looks like next week, she’s going to be the Lady in Peril, as we see Nicky Augustine’s muscle, Picker, delivering a rocking chair to her home. You guys. Next week’s finale is billed as a “special event.” That means someone dies, right? Nicky goddamn Kush is back, in all his drone-paranoid conspiracy theorist glory. “He’s a little touched,” Boyd tells Nicky. (Nicky: “Should I be scared?” Boyd: “Not if you’re secure in your political views.”) Kush’s downfall comes when he comes at Boyd with an ASSAULT RIFLE and yet fails to properly armor his feet. Classic blunder.